More and more dog owners are starting to incorporate raw meat into their dog's diet. Raw food provides a number of benefits to pups of any age and breed. Not only does it give you more control over what your canine companion is eating, but raw meals more closely resemble that of their ancestors. With all that being said, there are some challenges involved with making the switch. Raw diets tend to have a substantially higher cost than a traditional bag of your favorite commercially available kibble. 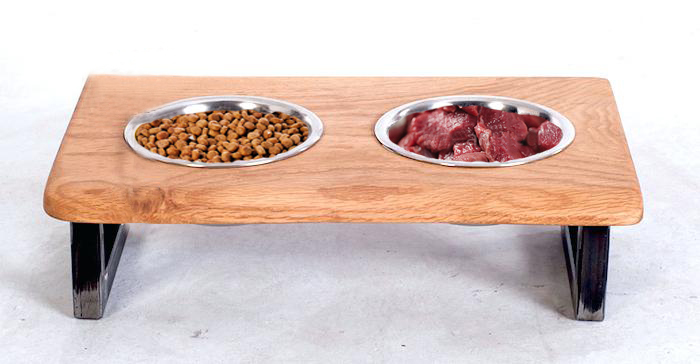 As a result, some owners are choosing to use raw meat as a supplement to a traditional dry food meal. While this all may seem fine at first, feeding a dog half raw half kibble meals can be detrimental to their health. To ensure that your dog can enjoy the benefits of raw food safely, you need to understand what goes on in your pup's body and why mixing dry food with raw food should be avoided. Dogs have a tough digestive system. It's capable of processing foods that we humans would have a hard time getting down. The process starts in the stomach. 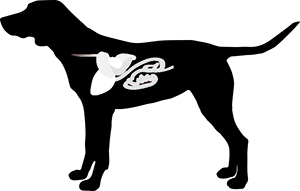 When food enters your dog's stomach, it is predigested by enzymes. These enzymes are found in a few parts of the digestive tract. Basically, they convert the food into usable energy. They can also help with the biological process that uses proteins and fats. For example, pepsin enzymes break down protein sources into usable amino acids. When the food is getting predigested by these enzymes, it's also exposed to a highly acidic environment. Hydrochloric acid is discharged from the stomach walls to give the stomach a low pH of approximately 2. This acidic environment is meant to fight off potentially dangerous bacteria and organisms that are in the food. They're taken care of effectively in the stomach during the predigestion phase to ensure that they don't cause issues further on down the line. The rest of the digestion process is handled in the small intestine. The bulk of the digestive enzymes enter the small intestine from the pancreas to complete the process. Your pup's digestive tract is more than capable of processing raw diets and traditional kibble separately. However, when you mix the two, problems can occur. Issues can arise because of the kibble's starch content. Starch is present in every dry kibble formula regardless of its quality. It's responsible for holding the various ingredients together and creating the shape of the individual pieces. Starch is perfectly fine when your dog is on an all-kibble diet. However, it is digested slower than raw food and can affect important biological functions that are needed for healthy digestion. Dry dog food formulas can be made up of 30% to 60% starch. It comes in a number of forms. In cheaper dog foods, the starch comes from things like corn or rice. With high-quality options, the starch may come from complex carbohydrates like peas and sweet potatoes. It's found in every single formula on the market. What Happens When You Mix Kibble and Raw Food? Adding starch to a raw diet can wreak havoc on your dog's digestive system. Nearly every step of the process is affected. This can lead to gastrointestinal upsets as well as more severe problems. One of the biggest effects that starch has on your dog's body is that it changes pH. It raised the pH level to make the environment more alkaline. However, the enzymes required to digest the food are only released in an acidic environment. Normally, your dog's stomach has an approximate pH of 2, which is required to release the important enzymes. When the pH is raised, the pepsin that breaks down protein can't do its job. The same goes for the enzymes in the pancreas that are released once the food moves into the small intestine. In addition to a lack of enzymes, a raised pH level will also let bacteria survive relatively unscathed. The acidic nature of your dog's stomach is the only reason why they can eat raw meat in the first place. The acid kills of harmful bacteria like E. Coli, salmonella, listeria, and more. Without that acid, the bacteria can survive and cause significant health issues. If left untreated, the bacteria can make its way throughout the body and bloodstream. Diarrhea and stomach pain is a common issue that is directly caused by the lack of digestive enzymes. Undigested food will continue to travel through the digestive tract even though it's not properly broken down. It will then interact with the healthy bacteria in your dog's gut. This can ultimately lead to inflammation and diarrhea. Undigested food can also cause the intestinal walls to become inflamed. Not only is this very uncomfortable, but it can trigger a response from your dog's immune system. Leaky Gut Syndrome occurs when undigested food passes through the walls of the intestines. It can make its way through the body, cause infections, and lead to immune disorders. Your dog may also experience infections in other parts of their body. Yeast infections can occur. Existing conditions can also get worse over time. This is because the Candida fungus is capable of prospering in environments with a higher pH. Your pup may start to suffer from yeast infections in their mouth, ears, and paws. They may also experience allergic reactions. Obviously, the best thing you can do to avoid these issues is to not mix raw food and dry kibble. However, that doesn't mean that you have to make the switch all at once. In fact, it's usually recommended that you make the transition slowly over time. Doing so will allow you to see what works for your dog and what doesn't. It will also let your dog experience the benefits of raw food without a dramatic increase in feeding costs. It's completely possible for your dog to stay healthy with both raw food and dry kibble. You'll just have to take a few extra safety precautions to avoid any serious issues. Here are some useful tips. One of the best ways to let your dog get the best of both worlds is to simply alternate between raw food and kibble. This is great as both a long-term solution and as a way to transition to a fully raw diet. For the first meal of the day, give your pup standard kibble. On their dinner meal, load them up on raw food. There should be a time gap of at least 10-12 hours. Between the morning meal and the evening meal, your dog's body will have plenty of time to fully digest the food. The starch will no longer have an effect on the pH level. As a result, they'll be able to comfortably enjoy raw food without any concerns. Probiotics are beneficial bacteria that can help with the digestion process. You can easily find probiotic supplements. Some commercial dog foods already have them included as well. By incorporating probiotics, you're helping to counterbalance the change in pH levels. The probiotics can lower the pH of the stomach. Not only that, but the introduction of healthy bacteria can prevent dangerous bacteria from harming your pup. There are a number of food ingredients that you can use to your advantage to make your dog's digestive system more effective. One of the most notable is apple cider vinegar. Just a small amount of apple cider vinegar can lower the pH of the stomach and kill off bacteria. Alternatively, you can use fermented foods like kimchi. Fermented foods are filled with probiotics that can lower the pH as well. A raw diet can make a huge difference in your dog's overall health. The nutritional content of raw food will help your dog thrive. However, this new diet is only effective if you do it right. It's important that you avoid mixing kibble and raw food together in one meal. If you must do that, you need to take the extra steps to prepare your dog's food correctly so that you can avoid any lasting issues. Also Read: Raw Dog Food Guidelines: How Much to Feed per Day?